Qurain, which is located twenty kilometers south of the city, is the home of the Kuwait War Museum, a popular tourist attraction with a grim past. It can easily be reached by taxi or car, in case you want to visit this landmark during your vacation. Most of the residents avoid it, primarily because of the sad tale behind it. However, scholars and researchers often find interest in the historical significance of this place. The gallery is open from Monday to Saturday at 8:30am to 12:30pm and 4:30pm to 8:30pm. On Fridays, you can only visit during the afternoons, as the staff members are given the mornings off. During Ramadan, the hall is only open at night from 8:30pm until 11pm. 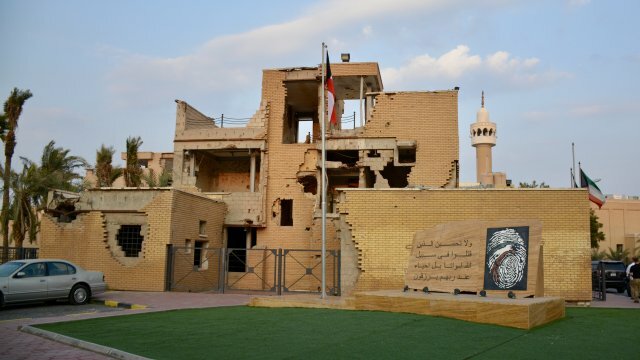 The Kuwait War Museum is actually a residential type of establishment, which serves as a monument in honor of a number of Kuwaitis who valiantly tried to keep Iraqi invaders from arresting them. The group was a part of the Al Messilah, a popular resistance force. It was in the 1990s when the patriots decided to use this house as a central base for their activities. On February 24, 1991, leader Sayyed Hady Sayyed Mohammed Alawy asked his troops to don on their personalized white shirt, which has an inscription of their army motto. That same day, they were spotted by an Iraqi patrol, and the fighting ensued. After ten hours of shooting, the makeshift station was reduced to rubble, and the still-standing walls were decorated with bullets and shells. Three combatants immediately died in the assault, while nine men, including Alawy, were captured and then tortured. General Schwarzkopf was later reported to have said that he regretted not being able to arrive on the scene four days earlier to help fight off the enemies. The late Sheikh Jaber Al Ahmed Al Jaber Al Sabah also demanded that this site become a nation memorial. Unlike other landmarks, the Kuwait War Museum is left untouched. Upon entering the site, you will still see the Iraqi cars and tanks, which were used to bomb the house in 1991. You will find yourself getting teary-eyed when you see the state of the house. Its walls are virtually non-existent, and the ground a vast of soil. Bullets litter the remnants of the building. The ruins are not much of a pleasing sight to look at. However, beneath the floor is a constructed hall, which serves as a preservation area that keeps plaques, relics, pieces of clothing, and other objects, which are of important value or related to what happened. The actual Kuwait War Museum, which is located underground, is more modern and clean. On the other hand, a certain kind of sadness still fills the air. Aside from the war remnants, you will see pictures of the men with their families and friends. Bullet cases, shells, and even guns are displayed on the walls. Documents and memos are also featured on glass panels. You are not forbidden to take pictures, as well. There’s nothing like a short trip to this gallery to make you experience the history of the country firsthand.